Facebook algorithm changes? Focus on own media, this is the only way. The platform is somehow acting childishly to its stakeholders and shareholders, with its constant changes, while its market decision-making resembles a pure ‘monopoly’. What’s going on? Has Mark Zuckerberg become a Sire? Will they drive publishers crazy, or we should not worry that much? What should bloggers, pages, and purposeful communities do? 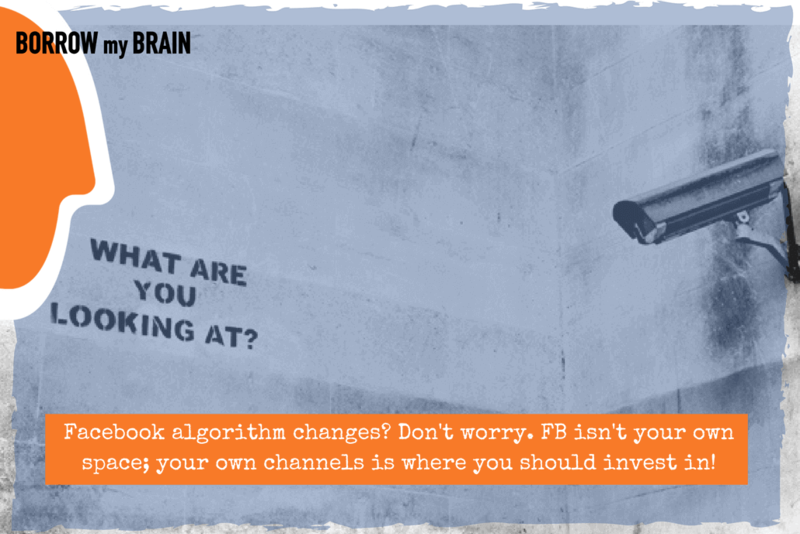 Two weeks ago Mark Zuckerberg in his published FB post announced new changes in the platform’s algorithm. I’m not exactly sure how it will go, or how it will be deployed, but the sure thing is that these changes will diminish at absolute zero the pages’ published content in our personal account timelines. Good for family and friends, bad for publishers, brands, communities, agencies, and advertisers. Of course, you can’t be sure if these changes will be permanent on Facebook for us, its users. The platform is somehow acting childishly to its stakeholders and shareholders, with its constant changes (300 per year? ), and while still experimenting, its market decision-making resembles a pure ‘monopoly (it is like hearing Mark and his management team pompously saying “I’m the Sire, I decide so”). For now, Facebook says it plans to transform the newsfeed to promote “meaningful posts”. Most meaningful posts? Who judges that? I think it all boils down to an FB’s plan to quiet down the corporate pitches and news, especially the fake news, to get back to letting friends hang with friends in a better “neighbourhood”. To tell you the truth, they do have a point. Every lousy (fake) entrepreneur was marketing a slides’ collection video, hidden political groups were splashing hate on the timeline and so on. Every company is an experiment. A learning on the way. And yet even among all tech giants, few experiments seem so emotionally laden as Facebook’s. The company has inserted itself between us and our friends — and between us and the news (fake or real) — and the ultimate result is anyone’s guess. The company and its positioning bring along a trust and credibility issue. Facebook knew it had a problem. It’s the cry of a mother for the kid stop wasting time on the platform. It’s the page/publisher who promotes (internet) ‘get-rich-quick schemes’ and lousy seminars. It’s the fake news ‘clan’ promoting hate and political racism. It’s the communities doing social causes and wide good. It’s recently redundant who now produces cupcakes. It’s the pensioner trying to find what’s going on in the (timeline) world. All of them on the same platform. Zuckerberg cites research that has been done (by Facebook and other sources) about the impact of social media on the population, and the results are not great. In December, Facebook admitted in a post titled, Hard Questions: Is Spending Time on Social Media Bad for Us? that it poses a mental health risk: “…when people spend a lot of time passively consuming information–reading but not interacting with people–they report feeling worse afterwards…researchers hypothesize that reading about others online might lead to negative social comparison–and perhaps even more so than offline, since people’s posts are often more curated and flattering.” The same research suggests that those “actively interacting with people” do feel better. The platform became full of fast, cheap video, which meant lots of stock footage with captions over it. This sort of video is one of the obvious losers in FB’s announcement. If you like passively watching 90-sec videos with the sound off, start looking at them elsewhere. Facebook smartly aggregated all of these communities and audiences in one place (almost 2 billion people), so it created the very foundation for a sophisticated advertising platform. It has become a media platform (whether they like that title or not). Around it many new digital/FB agencies and freelancers appeared, promising that they hold the ‘magic stick’ of likes and shares. Now the ad industry is in shock and advertisers will soon realize how expensive sport it will be. In the long run, it will ultimately charge a much-much higher premium to advertisers. Now by cleaning up our timeline, it will charge more for brands / pages / publishers offerings. Where does this leave a business that’s been working hard over the past 10 years (or more) to get customers to “like” brands on Facebook, follow your posts and engage with them on the platform? Facebook’s throttling of business content has actually driven their stock price north for many quarters to a US $526.33 billion market cap (and it does not look to be slowing down in a media world where ad spend is expected to hit about $580 billion with 4% growth from last year). Now the platform plans to promote posts that generate discussions over those that are passively consumed, it said. Company executives say they hope the changes will make people feel better about using Facebook, following a year in which critics have warned of its negative effects on society and the news. Facebook no more a news publishing powerhouse? Facebook has angered publishers with its recent algorithm update. And now some are now calling to be paid for the news they produce! Things are heating up fast between Facebook and publishers, and media mogul Rupert Murdoch thinks he has the solution: Facebook should pay publishers a “carriage” fee!! His announcement comes after Facebook claimed it would ask users to vote for “trusted publishers” who would then receive special treatment on the newsfeed. Murdoch’s point is that if (trusted) publishers are indeed enhancing the value and integrity of Facebook through their news and content, then Facebook has to pay for it! Facebook realized that more ads and more corporate content that is paying to be in the news feed, are not really helping Facebook brand and positioning. Let’s face it people do go to Facebook for their news, to relax, socialize, and primarily have fun. Of course, they connect with brands and more. Ultimately, it sounds like Zuckerberg and his team are figuring out what those of us in the media have known for a long time: quality content rules, too many ads poison the well, and understanding your consumers (what they really want to consume and connect with) can open up much better monetization models than disrupting them with ads that aren’t even close to being relevant. What will happen with fake news? Connected to US, Brexit, and many E.U countries’ elections, the awareness about actual and possible fake news has increased. There are lots of ongoing discussions about how to stop fake news. Stopping fake news before it has a chance to spread might be the main trend on all major social media platforms. In Germany, Facebook has announced a major initiative against fake news. And hopefully, this is driven by Facebook’s fear of becoming less credible as an aggregator of content. Mark (as if we are friends…), a piece of advice, go and acquire nice A.I. solutions to fight hoax and fake. Don’t just talk; act! What will happen now to pages/publishers? What will happen now with the pages, communities, content and presence of so many groups? Indicative examples: NFHS Network Hoops for kids loving basketball, the very qualitative Fast Company content, the humorous School Myths stories, the new Agency 2.0 – The Premier Crowdfunding Agency and the video-production offering of Goanimate? There are many tight-knit communities around TV shows, disabled kids, special schools, and sports teams. It is obvious that the time people spend on Facebook and some measures of engagement will go down. Big time! Will it be more qualitative time and newsfeed? Who knows? Use video: but do it with a purpose, with thought-lead and practical items – not for the sake of seeing your self in front of the camera. Live video is still being prioritized over all other forms of content because Facebook continues -2 years now- to chase a market position in the events business. Offer value and content: all your e-books, white papers, bold opinions, public agenda discussions are above the commonalities you hear and see around; do it with an end-user/consumer plan in mind. Don’t ever forget that content, people, and sharing breaks over machine algorithms. Rethink and optimize your marketing and public relations efforts and plan for word of mouth and online sharing. No2. Partner with credible influencers (partners, employees, loud voices). Social media platforms were meant to be ‘noisy’, and a huge following doesn’t guarantee massive reach anymore. On the other hand, businesses, websites, influencers must have a truly engaged audience. Companies and brands of all sizes should be moving their communications towards using credible employees, micro influencers, and joint events with experts. No3. Act with a new mindset in social media. Today it is possible for companies and brands to track exactly where someone came from and to know if they convert to their .com and own media. Sell directly through these platforms. So it will be in everyone’s interest to unlock the optimal approach to the social commerce of product and service industries. For Facebook: when you are a big corporation you should pay respect to markets, stakeholders, and shareholders. That said, no big company ever surprises its customers, users, partners (agencies) as Facebook is doing from time to time. It’s not only how often the platform changes, but how transparent it is for its promises and positioning. For people like me, marketing their views, opinions, events, services. Commercialization has become social, but don’t underestimate your presales physical efforts, and the importance of spreading your influence efforts to other channels as well. Life doesn’t start and end on Facebook. What’s your view? My story might lead you to rethink Transitions Borrow My Brain blog Borrow My Brain blog Who has forgotten the importance of Democracy?